Madrid is a city that I’ve visited repeatedly. The heady mix of history, culture, food and nightlife have always appealed to my inner hedonist, but it’s also a relaxed city with a lot of parks and a way of life that seems more human than most cities. Large enough to offer world class distractions, but small enough to feel intimate and friendly, is how I’ve always thought of Spain’s vivacious capital. Amidst the grand Hapsburg architecture, bustling plazas, top notch museums, leafy parks and buzzing neighbourhoods, Madrid is a city that has everything. Of course, it also has many of the negatives of cities everywhere, and it was noticeable during our recent long weekend that the number of homeless and destitute seems to have multiplied significantly since our last visit in 2015. Staying close to the Plaza Tirso de Molina, this was only too obvious. Madrid is still dealing with years of austerity from the financial crisis, and it’s very visible on the streets. 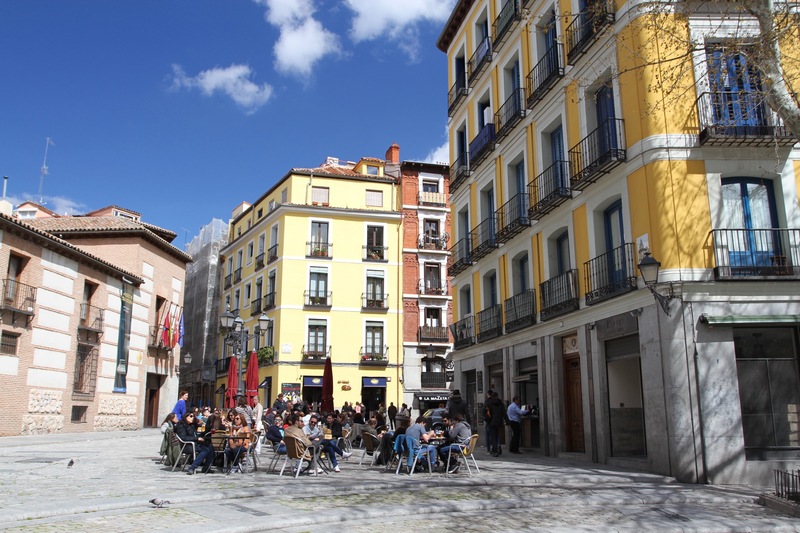 We arrived in the late afternoon and, after settling into the apartment, headed to the Plaza Mayor for a glass of something cold with some tapas. It might be touristy, but the Plaza Mayor is a wondrous introduction to the city. Perhaps the most perfect square in Spain? 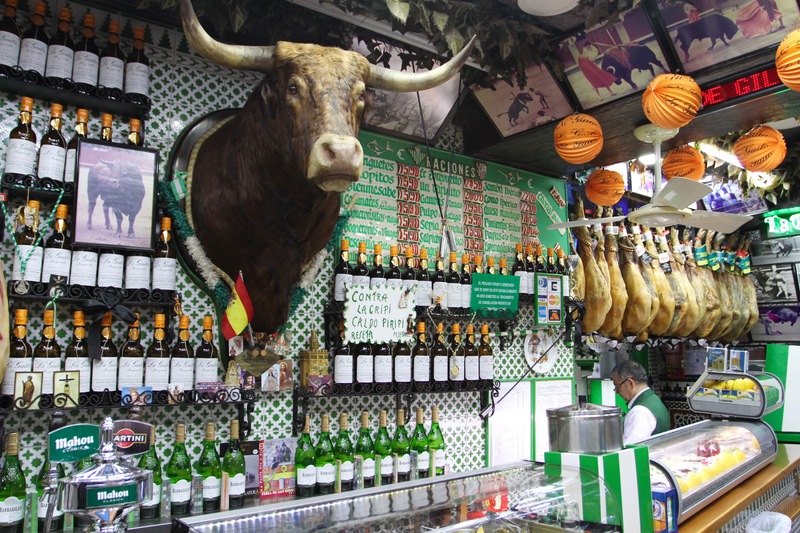 There was a time when bullfights were held here, today the closest you’ll get is a visit to La Torre del Oro, an Andalusian bar complete with bull heads and some of the most gruesome photos of toros getting revenge on matadors you’re likely to see – they could put you off your tapas. 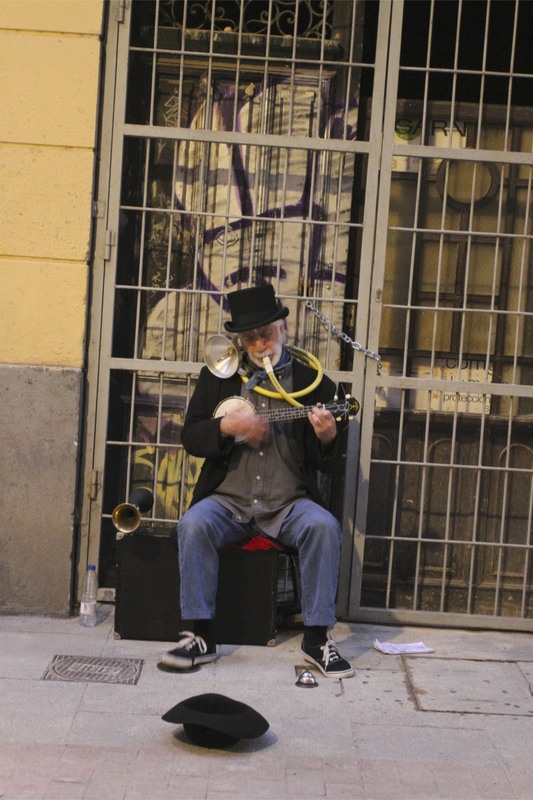 We spent the evening bar-hopping in the increasingly trendy Chueca district. 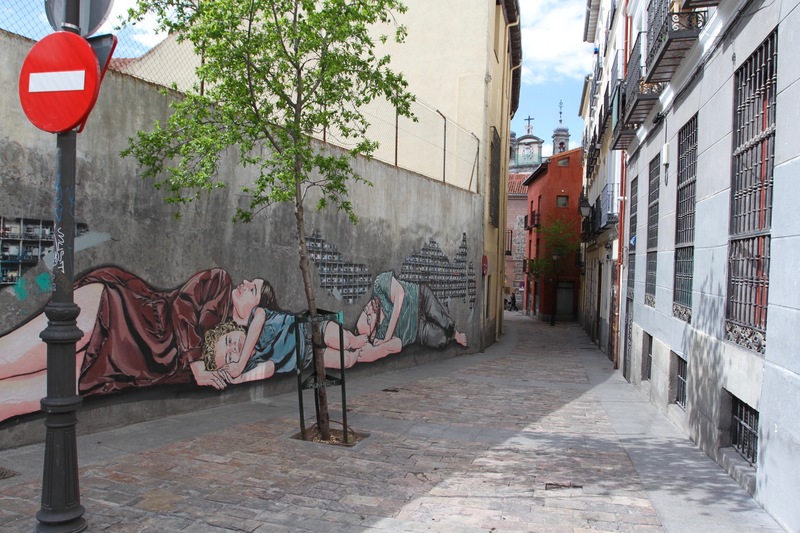 Once a rundown area, it has been completely rejuvenated as Madrid’s gay epicentre. 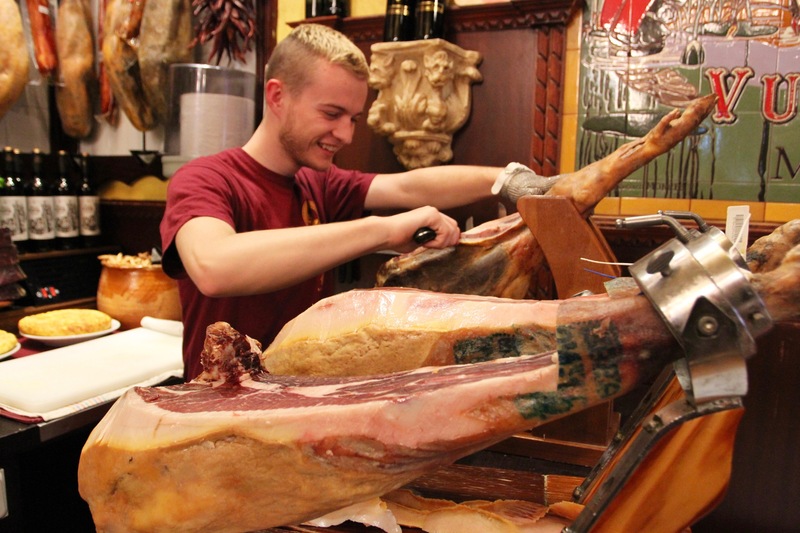 It’s a vibrant neighbourhood that is home to some exceptional eating and drinking options, including the Mercado de San Miguel, an old market transformed by adding a couple of dozen bars and restaurants. For all the modernity, there are still some traditions that remain, just pop into the Taberna Ángel Sierra on Plaza de Chueca to be transported back in time. We recovered the next day with breakfast in the Plaza Santa Ana. You know you’re in Plaza Santa Ana when you see the brilliantly white Reina Victoria, famed for being the hotel of choice for Spain’s best matadors. This is prime Hemingway territory, and off to one side is the Cervecería Alemana, where Hemingway claims to have shared a table with the most beautiful woman in the world. 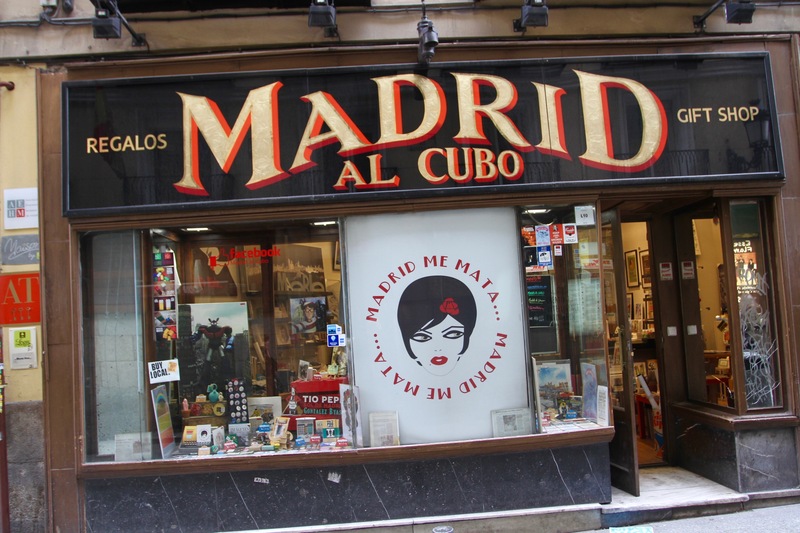 It’s a classic Madrid establishment, with world weary white-jacketed waiters who seem to have worked there for ever. A morning spent in the botanical gardens and the Thyssen-Bornemisza museum (one of Europe’s finest) was followed by a visit to the Atocha district. Like Chueca, when I first came to Madrid there was nothing very interesting in this district, but now it’s full of bars and restaurants. 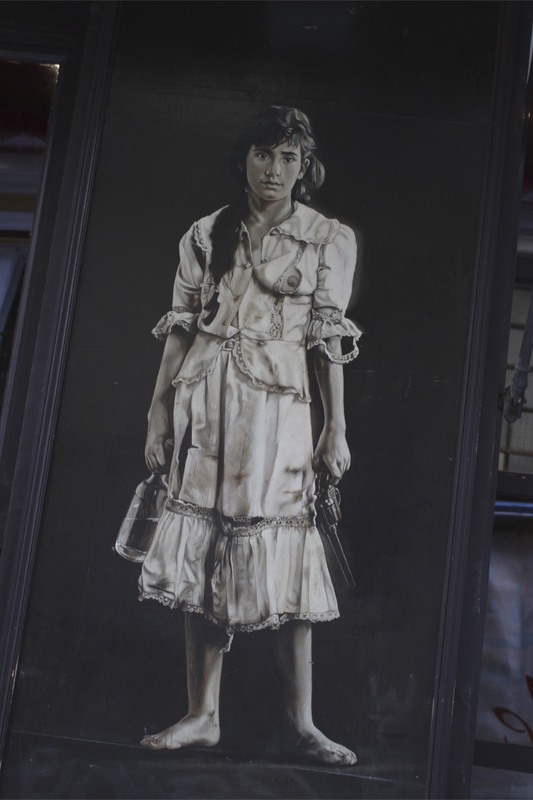 We walked off lunch through the narrow streets of Lavapiés. 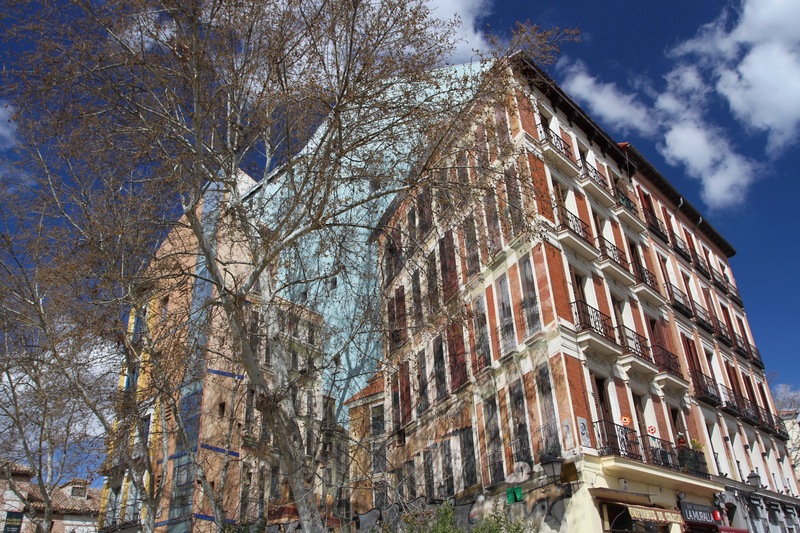 Perhaps the most bohemian of all Madrid’s barrios thanks to the high percentage of immigrants that have settled here. This is a fascinating area that retains a sense of its radical working class roots even as gentrification takes hold. I haven’t been to the Sunday morning Rastro market for twenty years, but it was close to the apartment and handily en route to La Latina and the Royal Palace. 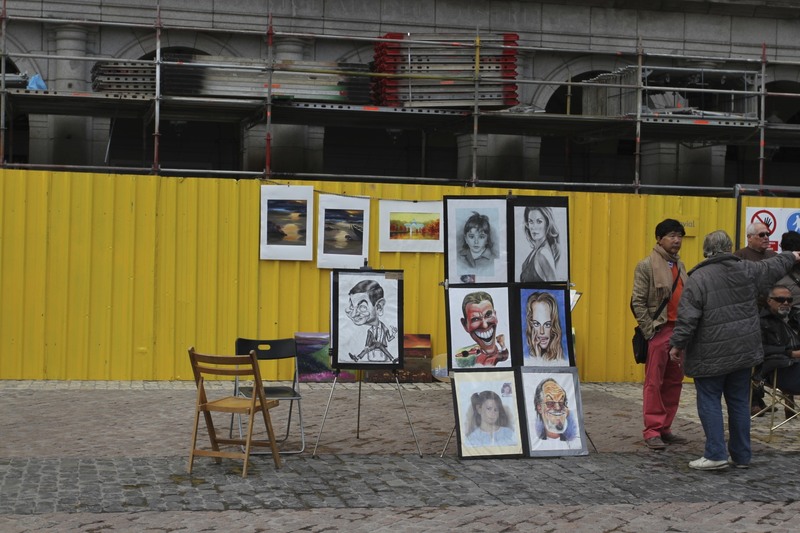 My memory is of a genuine flea market with occasional antique stalls, but the modern Rastro seems to be an homogenised mash up of tourist memorabilia that you could get in almost any country on earth. We meandered amongst the uninspiring stalls before trying to find somewhere for an outdoor lunch in one of La Latina’s many plazas. On a sunny Sunday, that’s easier said than done. Our plan had been to visit the Royal Palace, but it was closed due to a state visit. It’s pretty impressive from the outside, but that doesn’t give a sense of what awaits inside some of the palace’s two thousand rooms. Still we could at least wander through the palace gardens, which were busy with people soaking up the sun. We made our way back to the packed Puerta del Sol and rewarded ourselves with a drink and tapas in the Casa Labra. The next day we’d be off to Segovia, a much needed rest from a weekend in Madrid. We had a car waiting at Madrid airport, we had a road map of Spain and we had a plan. Plans are good, but as the “wee tim’rous beastie” of Robert Burns’ poem knows only too well, the best laid plans “gang aft agley”. Part of our plan was to bring the road map with us, but that’s the thing about packing in a hurry. The road map was gathering dust on the dining table back in the Netherlands, but we still had a car and a plan…and that seemed sufficient to have fun in Spain. The weather changed our plans as well. The unexpected cold rain of earlier in our trip finally giving way to more traditional southern Spanish weather as we headed to Cordoba – something we did earlier than intended. The hills of Aragon will have to wait for another time. I love being in Spain. It’s easy to over-romanticise given the nature of Spanish politics, past and present, and the terrible impact of the economic crash; but I’m not the first northern European to have formed an unhealthy attachment to Spanish culture, seemingly little changed even in this era of globalisation. Where else can you be sipping a coffee in a small cafe, while next to you several locals down large (and rough) Spanish brandies at 8am on a Tuesday before they head off for a, what I imagine is a less than productive, day at work? Malaga was an unexpected pleasure – great food, great nightlife, a brilliant Picasso museum, wonderful history – Semana Santa an unforgettable experience. Before visiting I’d only thought of Malaga as part of the benighted and blighted Costa del Sol of my nightmares. Now, I’d go back in a flash. 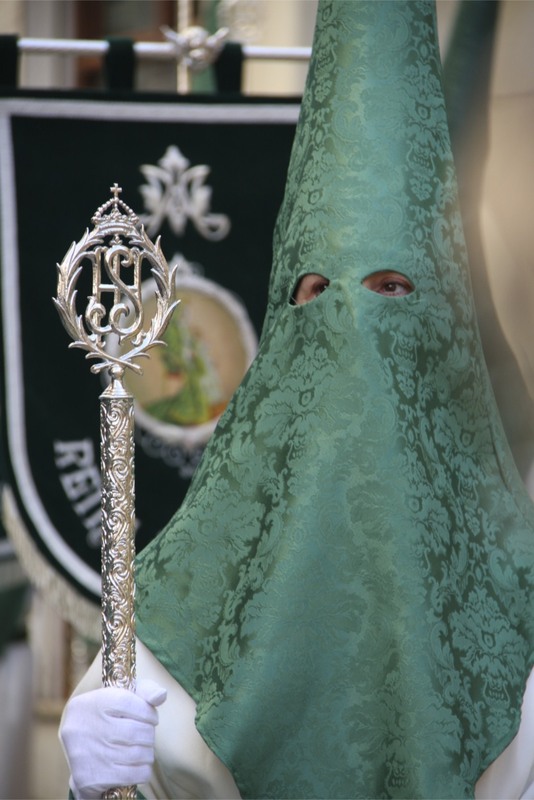 Semana Santa was just the cherry on top…an incredible festival lasting a full week. The town seems never to sleep; when it does it’s a sleep brought on by the exhaustion of too much partying – a party where tradition merges with faith, merges with modernity. It’s incredibly atmospheric. 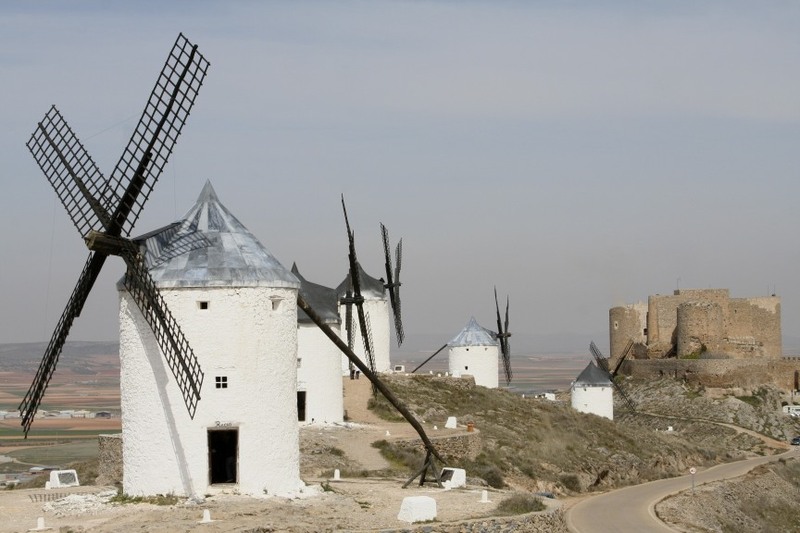 It’s no surprise that there is something quixotic about the red earth, white windmills and monumental castles of Castilla-La Mancha. It’s a word given to the world by Cervantes’ most famous literary creation, a dreamer of fantastical and romantic dreams, for whom the baked landscape of this off-beat region seems entirely fitting. Toledo, former home of Spanish kings and centre of the Catholic Church in Spain, is a must, as are the hanging houses of Cuenca; alternatively, tilt at windmills in Consuegra, or visit a piece of northern Europe in Almagro. Most of all, travel the narrow, near deserted roads through this mesmerising region. People visit Spain just to see Cordoba, to walk its medina-like streets and marvel at the magnificent Mezquita. It’s worth making the journey. 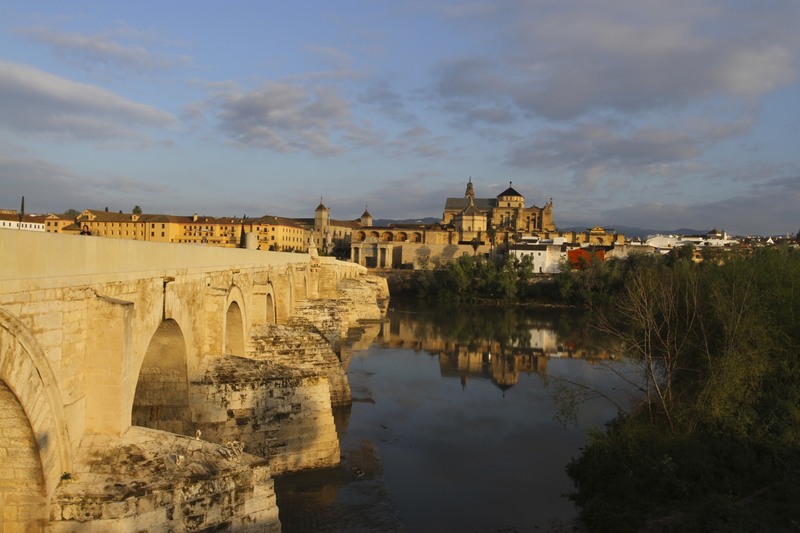 Spain wears its history on its sleeve, nowhere more so than Cordoba, where Spain’s Moorish and Christian histories collide and merge. The Mezquita can get crowded, so try to get there at 8am when the doors open, entrance is free and tour groups aren’t allowed for a whole hour. You won’t be alone, but you will be able to absorb some of the genuine majesty of this Islamic architectural masterpiece in relative peace and quiet. Divine. The White Villages of Andalusia are beautiful reminders of Spain’s history and traditions; it helps that many of the most picturesque villages sit inside the mountainous Sierra de Grazalema Natural Park. The stunning landscape, dotted with Pueblos Blancos, is like in a fairytale. Many of the villages include ‘de la frontera’ as part of their name, testimony to their location and role as fortified outposts on the boundary between the Christian north and Muslim south up until 1492. Spring is the best time to visit, the landscape is coming back to life and there aren’t so many tourists, or tour buses, on the roads. For my money, Europe’s most vibrant and interesting capital city. True, I’ve not visited every capital city in Europe, but I’ve been to enough to know that it would take something pretty special to dislodge Madrid from the place it has in my heart. 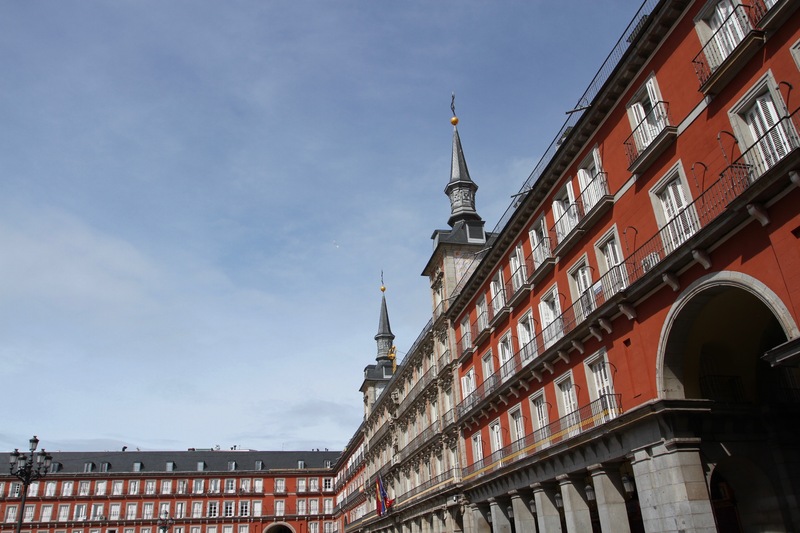 Consider the grand Hapsburg architecture, a multitude of world-class museums and galleries, superb food, relaxed and friendly people, and a nightlife to rival anything Europe’s other capitals have to offer…what’s not to love about Madrid? Plus, for a big city, it has to count as one of Europe’s most affordable. Take to the streets and explore at leisure. 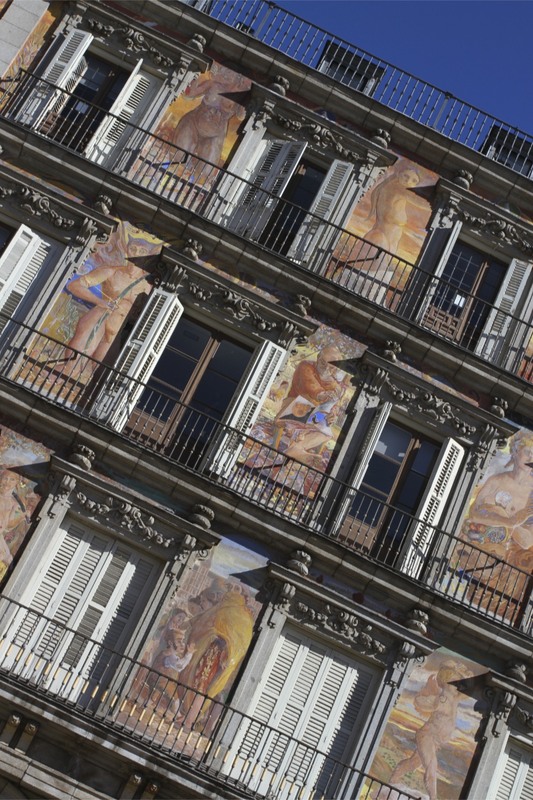 Madrid, like much of Spain, is a city where life is lived outside. Whatever time of day or night there seems to be human energy surging through the city: people pack the streets, crowd plazas or stroll around the parks. It’s one of the things I like most about the city. Life is everywhere. The weather helps, and when we were there the sun shone from clear blue skies, temperatures soared and people headed to public spaces to enjoy it. That isn’t always the case, we were once here when the temperatures were barely above freezing and the rain in Spain wasn’t mainly on the plain. The spring weather was perfect for getting onto the streets and just wandering. One of our group (of two) had a birthday so we made our way to the Plaza Mayor for a café con leche and some light people watching, while waiting for the nearby Mercado de San Miguel to open its doors. This wonderful old wrought iron and glass produce market was little more than a wreck the last time I was in Madrid, now it has been renovated and houses more than thirty high quality tapas bars. It can be a bit touristy, but the food, drink and atmosphere are perfect. We sampled a ‘birthday’ glass of delicious amontillado with some boquerones and jamon serrano, while telling ourselves that in Spain having a glass of sherry at this time of day was nothing unusual. We decided we were just blending in, culturally speaking, so we decided to try an oloroso as well. Also delicious. 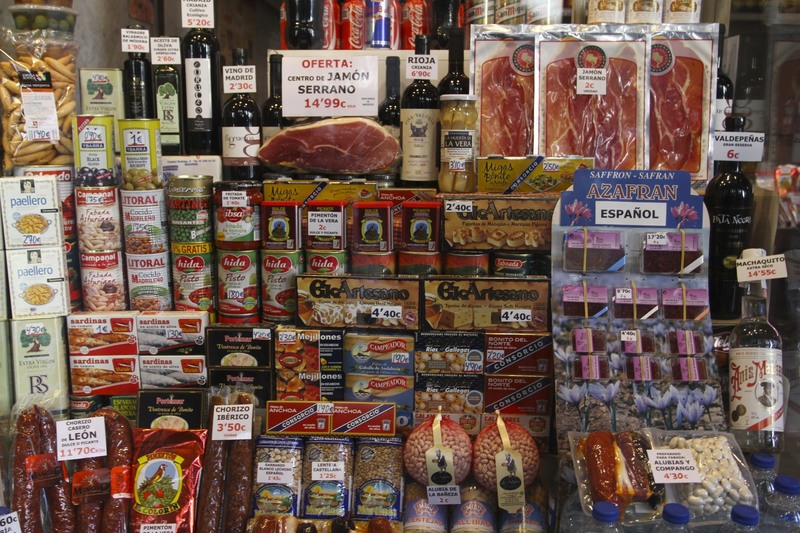 This type of foodie marketplace seems quite fashionable in Madrid. 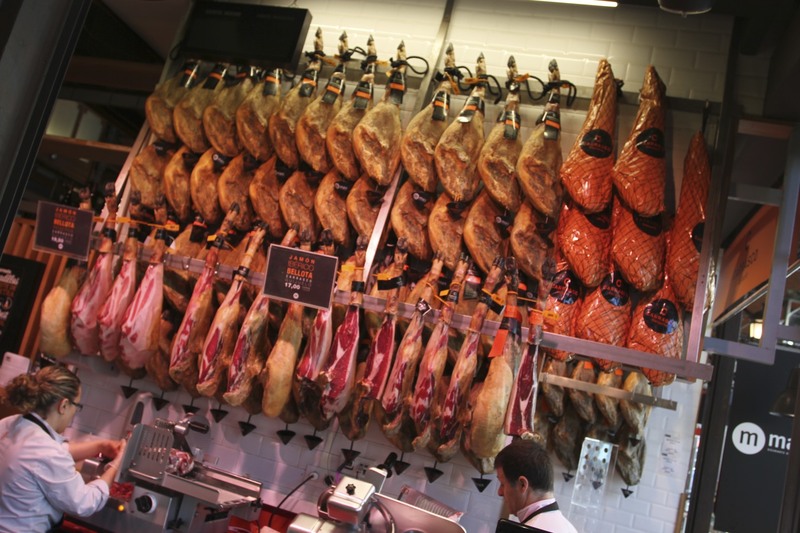 Just up the road from where we were staying in Chueca is Mercado San Antón, larger and not quite so upmarket, it still has delicious food and a good atmosphere. We could have stayed in Mercado de San Miguel for hours but Madrid needed exploring. We wandered aimlessly through La Latina, a barrio that is full of life and stuffed with fabulous tapas bars, before making our way over to the Royal Palace. We were going to visit but there were just too many people, most of them with selfie sticks, so we moved on. Taking this as a sign that most of Madrid’s big attractions would be equally busy, we meandered our way through Justicia and Almagro barrios to the Museo Sorolla. The museum showcases the work of artist Joaquín Sorolla, famed for his exquisite paintings of typical Spanish scenes, people and landscapes. The added benefit of a visit is that the collection is housed in Sorolla’s beautiful former home, and you can see his work in situ inside his studio. Sorolla came from Valencia and it’s his extraordinary ability to capture the light along the Mediterranean coast that sets his work apart. Well worth a visit. Central Madrid is relatively compact and easy to explore on foot, especially if you have regular tapas breaks to keep your energy up. By the time we reached the Plaza Santa Ana – more people watching in front of the ME Madrid Reina Victoria hotel where famous bull fighters stay, and a vermouth in Hemingway’s favourite bar – and made our way over to the area around Lavapiés, it was time to stop walking and do some serious eating. Luckily this area is packed with tapas bars and restaurants, and time passes quickly when you’re having fun. We returned to the hotel late, tired but victorious. The streets were still full of people enjoying themselves, but we needed to rest. In the morning, we’d just have time for breakfast before heading to the airport and back to the Netherlands, our Spanish road trip complete. Madrid was the very first Spanish town I visited as an adult. It was love at first sight, at least on my part, and the more I go back the more I’m convinced that Madrid is probably the finest capital city in Europe. 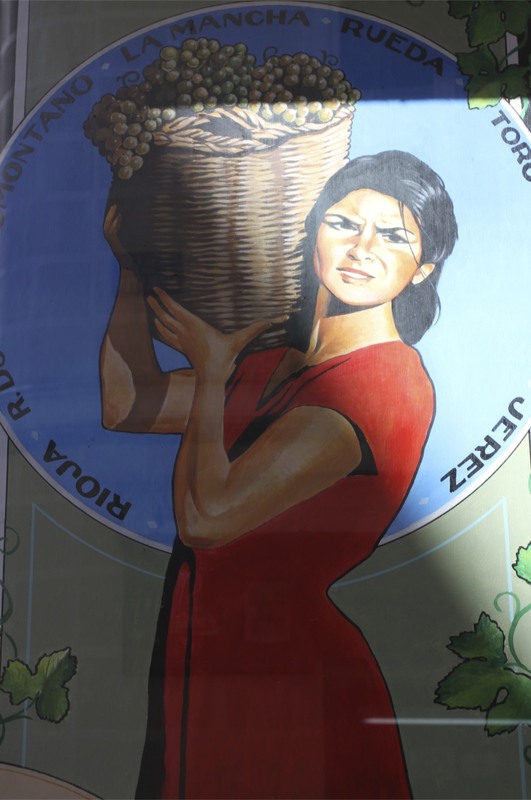 Vibrant, cultured and friendly, but a little rough around the edges. Madrid is home to incredible history, world class museums, food rivalling anything on the planet, a fabulous nightlife and an easy going attitude. 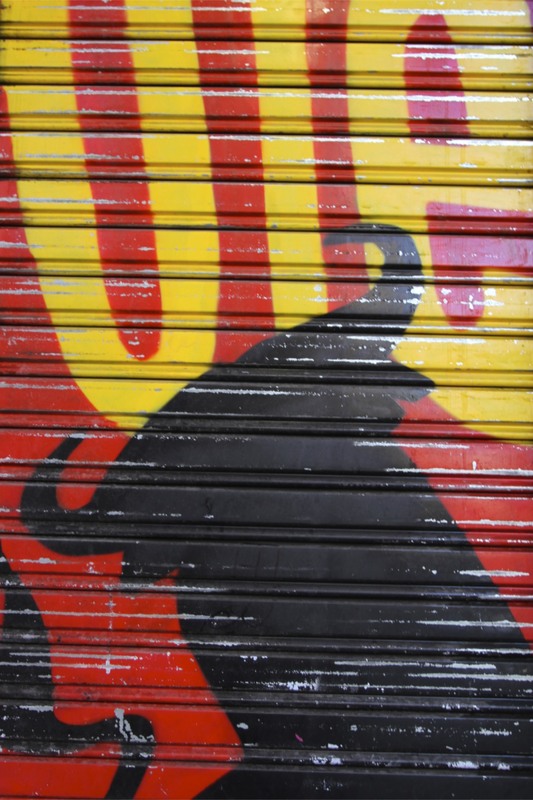 It’s Spain condensed – every Spanish region represented amongst its barrios – but more than the sum of its parts. To cement the deal, it is an affordable city – at least for a European capital. It’s probably impossible to not to feel a little overwhelmed by the sensory overload Madrid induces. 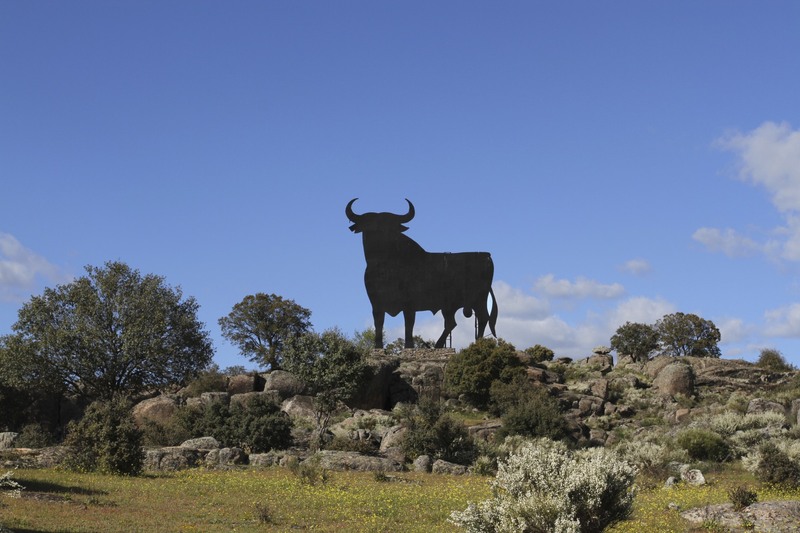 When you’ve just spent several days in rural Spain, out in the wilds of Andalusia and Extremadura, you have to try not to overdo it in the first 48 hours. Madrid is just too alluring and we definitely overdid it. 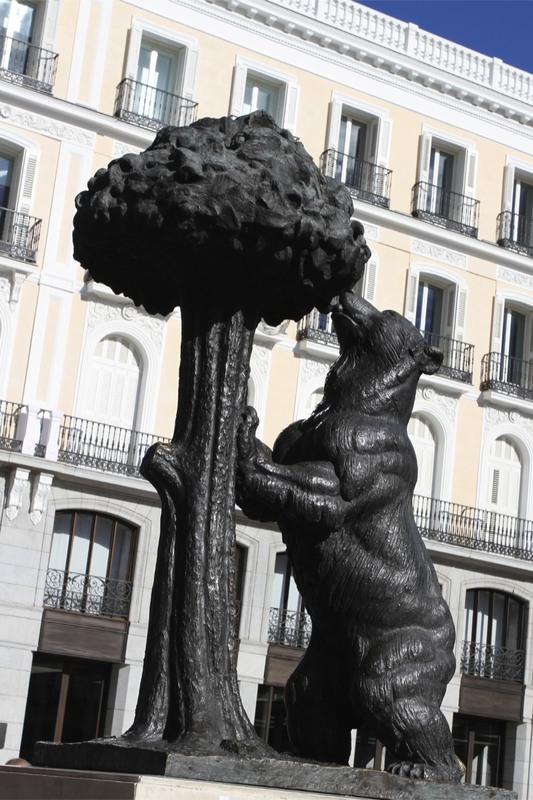 We walked for miles through the buzzing streets, visited historic houses, small galleries, large museums, dozens of tapas bars, a couple of traditional sherry bars, some great restaurants and sat soaking up the sun, people watching in the wonderful plazas in which Madrid specialises. It was exhausting and completely exhilarating. I know I’ll upset a few people, but there is nowhere else in Spain that can match Madrid for sheer excitement. I’ve been to Barcelona, liked it, but wouldn’t swap it for Madrid, where they at least give you tapas with your drink. 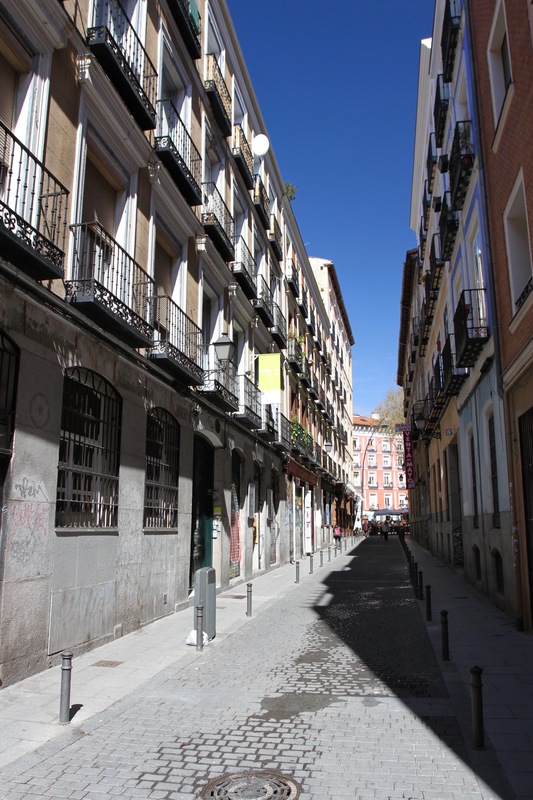 We stayed in Chueca, which I’d describe as up and coming if it hadn’t already up and come. 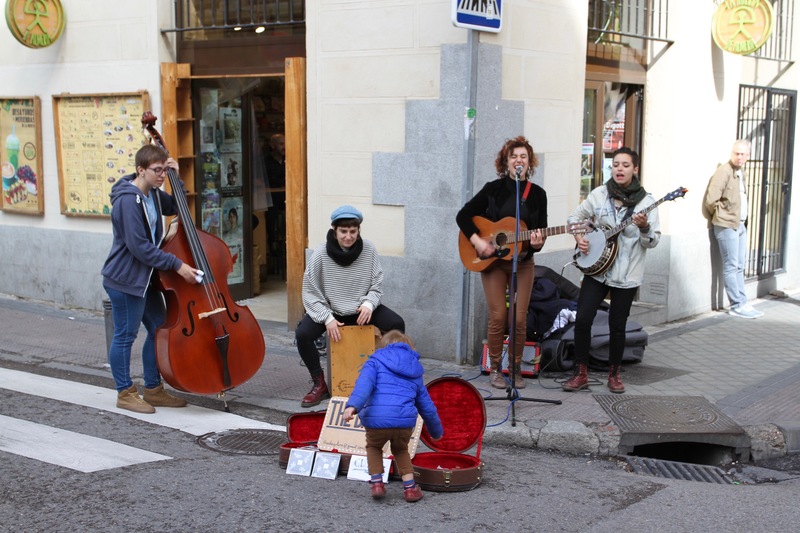 It’s handily located for the centre of town, but has everything a visitor might want in a barrio, including an alternative vibe with fabulous bars, food and atmosphere. It reminded me of my former home of Shoreditch in London. We decided not to over-plan our visit and headed off in whatever direction seemed appropriate. Since we hadn’t been in Madrid for a few years we retraced our steps through some of our favourite areas: La Latina, with historic and fun Calle Cava Baja and the open air market of el Rastro; Lavapiés where traditional Spain rubs shoulders with modern immigration; the buzzing area around Plaza Santa Ana and down towards Atocha train station; and not to forget a pilgrimage to Paseo de la Florida, bordering the Casa de Campo, for lunch at the wonderful Asturian restaurant, Casa Mingo. It was a veritable trip down memory lane. We might have been overcome with nostalgia, but Madrid doesn’t allow that. There were familiar streets, familiar sights, familiar tapas bars and restaurants, but in none of the areas we visited has time stood still. Traditional Spain never seems far away, but these areas seemed renewed and more vibrant than ever. We may have had sore feet by the end of each day but we had a huge amount of fun. Madrid’s that sort of town.